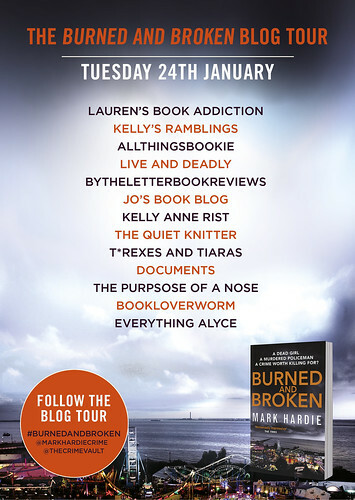 t*rexes and tiaras: Tuesday Titles 116: Burned and Broken blog tour.. The charred body of a policeman - currently the subject of an internal investigation - is found in the burnt-out-shell of his car on the Southend seafront. To DS Frank Pearson and DC Catherine Russell of the Essex Police Major Investigation Team, the two events seem unconnected. But as they dig deeper into their colleague's murder, dark secrets begin to emerge. It's not often that you find a debut crime novel which is up there with some of the most established writers of the genre, but I think that Burned and Broken is deserving of that title. I guess I struggle with crime reviews as there's so much I don't want to spoil by giving too much away. Our detective duo in this debut novel are Pearson and Russell, and there are as you might expect, the usual personal background issues, which make the two a little more 'real'. Also trying to find some answers is Donna Freeman - a young lady who is convinced that her friend has been murdered. 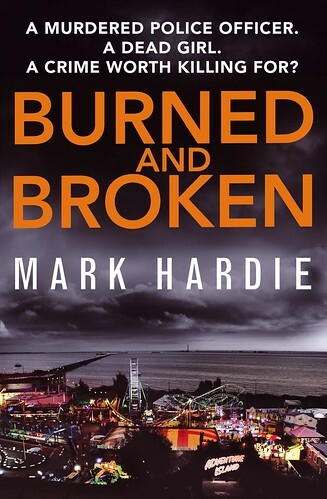 Right from the very first chapter, Hardie describes the final moments of our first victim's life; the moment of realisation as he becomes aware of a match being thrown into the car in which he is stuck and injured. From this point, we are taken back to the days leading up to these gruesome events and suspicions are raised. Very nicely written; I'm only sad that it's a while until there will be a second book in the series - I'll definitely be eagerly awaiting it.